A small This ART 2 Tone exhibition will be shown at the Farmhouse, Canterbury SKA SUNDAY on Sunday May 30th. The Folkestone SKABOUR Festival is happening on September 3rd, 4th and 5th 2010 at Folkestone Harbour as a FREE event with the 3rd and 4th evening ticket or on-the-door priced venues around the Creative Quarter as Festival fundraisers. Some of the UK best Ska bands and a major one all to be announced very shortly. Ska DJs. Scooter Club Ride Outs and parked up at the harbour. Ska Market. Dance Craze showing at venue. Folkestone welcomes representatives of 2-Tone Central (museum/café/venue), Coventry plus much more. This ART 2-Tone exhibition, the rude boy black & white stuff by Teflon, all September at Googies Art & Music Café and also Chimaera Gallery, Folkestone. THIS IS GOING TO BE SOME SKANKING PARTY. BOOK IN FOR THE WEEKEND (see website). 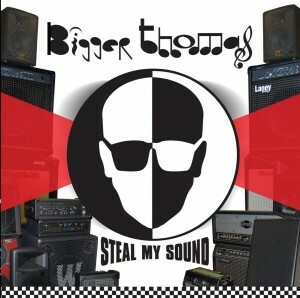 SERIOUS SKA BANDS FEAST OF MUSIC TO YOUR EARS. 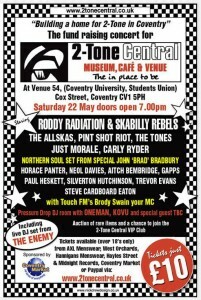 2-TONE CENTRAL Fund Raiser… message to you Rudy! 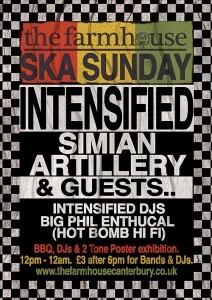 Celebrating 22 years of ska and reggae in 2010!! Bigger Thomas continues to keep crowds moving and grooving to their patented version of reggae ska that includes a heavy dose of traditional and 2-Tone ska thrown in for good measure. The band reflects the cultural diversity of the city they call home with members who have roots in the NYC metropolitan area as well as Haiti, Jamaica and the UK. Best known for their upbeat ska-pop song “Ska in My Pocket” they now play a diverse style encompassing ska, reggae, calypso, punk, african and latin rythyms. They have had the pleasure of performing alongside the English Beat, Colin Hay of Men AtWork, Pato Banton, Jimmy Cliff, Yellowman, Burning Spear, Bad Manners, The Selecter, Special Beat, De La Soul, Bim Skala Bim, The Alarm and The Toasters. The band will release their new 10-song album ‘Steal My Sound’ as a digital download and on CD in May 2010. The album was recorded at Version City Studios and produced/mixed by King Django. The art work was designed by John ‘Teflon’ Sims who helped to design album covers and art work for The Specials, The Selecter and other 2-Tone bands. Bigger Thomas Mr 2Tone logo Illustration: Roger Apollon. The band’s other albums ‘We Wear The Mask’, ‘Resisting Success’ and “Bigger Thomas” a CD/DVD reissue of their first out-of-print LP are also available online at itunes.com and CD Baby. You are currently browsing the classic 2-tone graphics news archives for May, 2010.